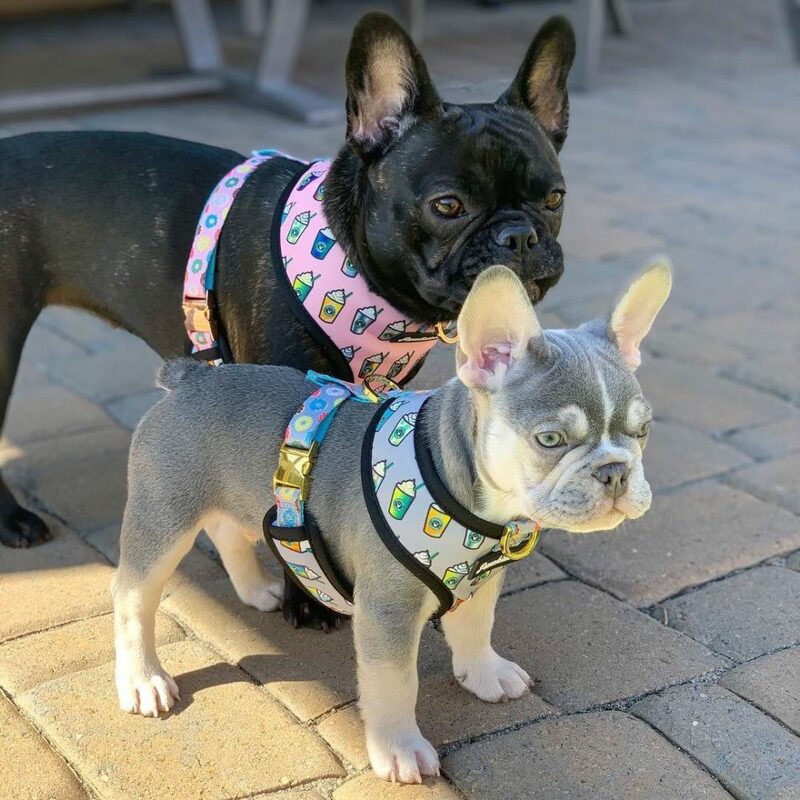 French Bulldogs are stubborn yet fun animals, and that is why Frenchiestore Health Harness is highly recommended by vets all around the world. Buying the best French bulldog harness is a must to lead a healthy positive relationship with your pet. Moreover, a great Frenchie harness acts as an excellent training tool by giving you a good grip to help you control the Frenchie without hurting or distressing the pet. The best Frenchie bulldog harness is your savior, especially if you find yourself struggling to control your French bulldog. The Heath Harness features dual leash attachment and offers greater control over your dog. This innovative harness was especially designed considering the health of the pet and do not put any pressure on the pet's neck. What is Frenchiestore vet approved Health Harness? The Health Harness is made with double breakaway metal buckles to offer maximum safety. The Frenchiestore do not produce any items with plastic buckles as plastic buckles are well known to be dangerous for pets (choking and breaking hazard). The Health Harness created with dual D rings for leash attachments and makes this harness a no pull-back, and a no choke harness when walking with your dog. The product was created with dogs with BOAS in mind and had various uses. The D ring found on the front side makes the harness is ideal for training your dog like pulling, along with dogs with hostility and supremacy issues. The harness is equally useful for dogs that suffer arthritis, those receiving water therapy, and those with mobility problems. In addition to that, the harness is beneficial to French bulldogs or any other breed of bulldog suffering from inter-vertebral disk disease, commonly known as IVDD. The dogs with earlier neck, spine, or back injuries, and the ones with a vision deficit can also benefit from this product. The health harness is usually used by dog rescue organizations, who has many dogs with various health-related problems. Breeders also use this product where they use the front D ring for their pregnant dogs to ease pressure on the abdomen. Why should you use a Health Harness? A dog’s behavior can at times define the owner’s role. A great dog harness helps control your pet and develops a positive relationship between you and your pet. You want to be the leader of the pack, not the other way around. In addition to that, keeping in mind that bulldog puppies are impulsive and high spirited, it is not advisable to use a collar on them since they may pull on the leash and choke themselves. Such an instance may lead to trachea trauma or even worse. That is why harness is always recommended. Does the harness fit well? Well, always make sure that the harness you intend to buy is adjustable enough. When buying the Health Harness the most important thing to consider is the neck measurement. The belly strap is adjustable. If you purchased the Health Harness and you got the wrong size, do not worry they have a satisfaction guaranteed and will either refund or exchange your Frenchie harness to make sure you got the best fit. Depending on the climate, it is good to choose a harness that won’t get affected by the weather. Frenchiestore Health harness is made of the highest grade materials that are so versatile to adjust to any weather, easy to clean and water resistant. Frenchiestore Vet Approved Health Harness comes with naturally felt advanced webbing technology to make sure that the harness is comfortable and safe for the dog. Padding is an important feature to consider when striving to purchase the best dog harness. Budget is the last thing to consider when it comes to buying a Frenc​​​​hie bulldog harness. While how much you are willing to spend on a harness should not decide the effectiveness of a harness or the safety of your pet. Frenchiestore Vet Approved Health Harness is completely a reversible harness which gives you 2 looks in one. Essentially you are getting two harnesses with fun colorful prints for the price of one. What a bargain! Frenchiestore Vet Approved Health Harness buckles are the safest in the industry since they prevent strangulation or injuries. Frenchiestore does not compromise when it comes to the safety of the dogs. The buckles come with breakaway technology with the latest safe technology. After researching all about Frenchiestore Health Harness we believe it is well worth the investment. When you invest in a quality Frenchie bulldog harness, you experience superior craftsmanship, quality, and the safety throughout the harness and will enjoy it for many years to come. Disclaimer: We are not affiliated with www.Frenchiestore.net .This article simply states our opinion.